Retired U.S. Army Maj. Tracy Riley is no stranger to conflict. A decorated veteran who served in Operation Desert Storm, Operation Enduring Freedom, and Unified Response Hati, Riley knows what it means to stand strong in the face of adversity. She just never expected to be facing so much of that adversity here at home. Riley was no fool – New Orleans brings in millions of visitors each year. 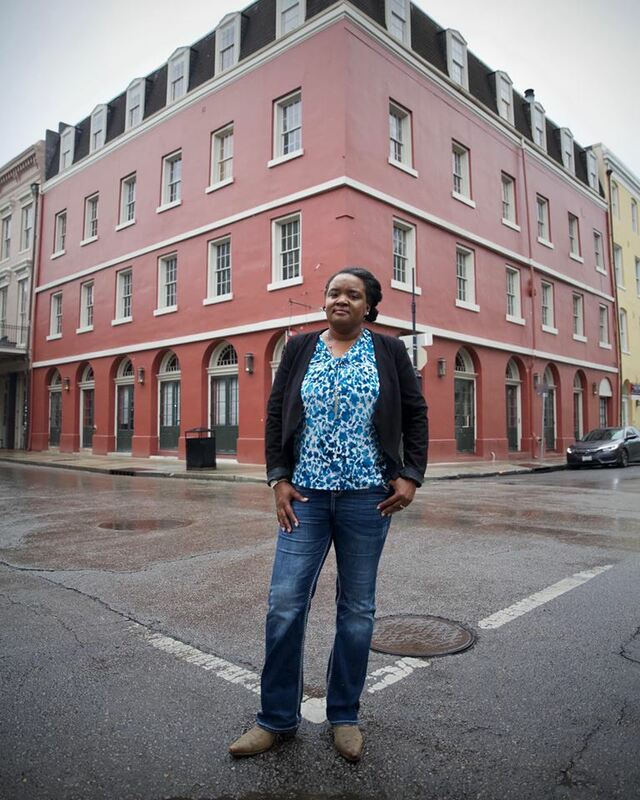 By placing her business in the heart of the city’s famous French Quarter, she was sure that her dream would thrive. Her plan was to use the sales of food and alcohol in the supper club to invest in the equipment and services needed to operate the recording studio and radio station. In June of 2013, Riley signed a lease to purchase the building “as-is” for the heart-stopping sum of $6,060,000, payable in installments of $25,000 per month. She even put down a first and last month’s payment of $50,000. Riley believed that she would be able to begin operating and recoup that money quickly, as her lease agreement stated that the owner of the building would “transfer and assign” to her the building’s liquor license until she was granted her own by the Louisiana Alcohol and Tobacco Commission (ATC). But that wasn’t the case. When Riley asked for the license be transferred ahead of Essense Fest that year, the building’s owner refused. Later, the owner’s lawyer would testify that the language of the lease was misleading and that the owners never had any intention of actually transferring the liquor license. In fact, doing so may not have even been legal under Louisiana law. “Licenses are not transferred from one person to another,” attorney Robert Biederman stated. “The current licensor will generally surrender their license and a new license will be issued to whoever the transferee assignee is.” He also stated that in spite of knowing that in Louisiana licenses can’t actually be transferred from person to person, he still drafted the lease using the misleading language. The liquor license wasn’t the only issue. According to the lease, Tracy had to purchase the property “as-is,” which she correctly assumed meant that she would need to perform any necessary repairs and updates to the building before she could open. What she didn’t know, and what the owners didn’t inform her of, is that the “as-is” purchase also meant that she would be held responsible for current code and ordinance violations against the building. The week of July 24, 2013, Riley was informed that there were a number of violations dating back to 2011 against the property. As a result, the City of New Orleans would not grant her an occupational license until those violations were cleared. Under oath, Biederman testified that neither he, nor the building’s owners had made Riley aware of the violations, but that the building’s owners considered them to be a part of the “as-is” purchase. The misleading lease and non-transferrable liquor license weren’t the only hurdles facing Riley. 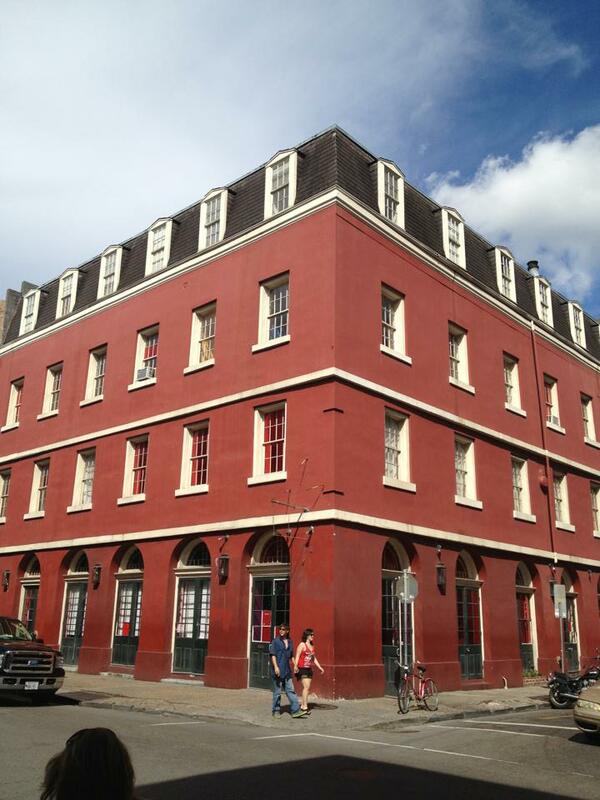 She had no idea that the property had previously been a major point of contention between the owners and members of the French Quarter Business Management District (FQMD), the Vieux Carre Property Owners, Residents, and Associates (VCPORA), and the French Quarter Business Association (FQBA). That one slip-up was all it took. After obtaining a City of New Orleans liquor license, Riley carried her state liquor permit application to the ATC office in August of 2013. But when she arrived, she was told that her application had already been red-flagged for opposition. Riley was confused; under Louisiana state law, opposition to an application cannot be submitted until after the liquor license application has been submitted. The ATC had allowed roadblocks to be placed against her business before Riley even had the chance to apply. Eight days later, Riley returned to the ATC office, requesting a copy of the opposition documents. Though she was originally told that the person who was handling her application was on vacation, Riley persisted and was eventually given access to a 70-page document containing opposition and affidavits. 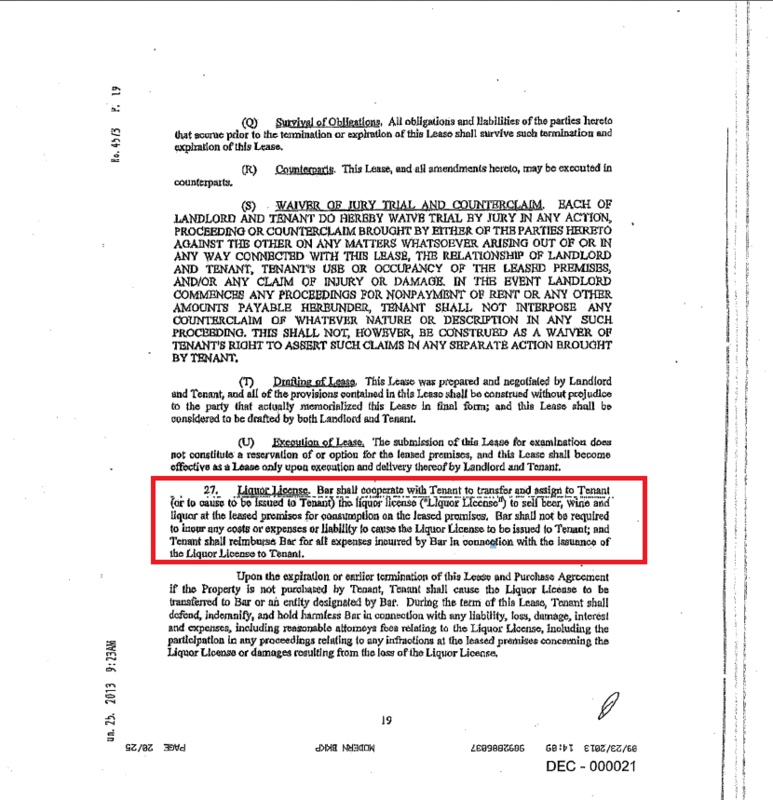 It was while reading through this document that Riley realized that the opposition had been filed the day before she had submitted her application. A public hearing took place on Sept. 4, 2013, regarding the Rouge House. During the hearing, businesses and residents alike vocally reiterated the concerns that the Rouge House would operate as a nightclub, even going as far as to submit photos of happenings at the previous establishment, Viola. 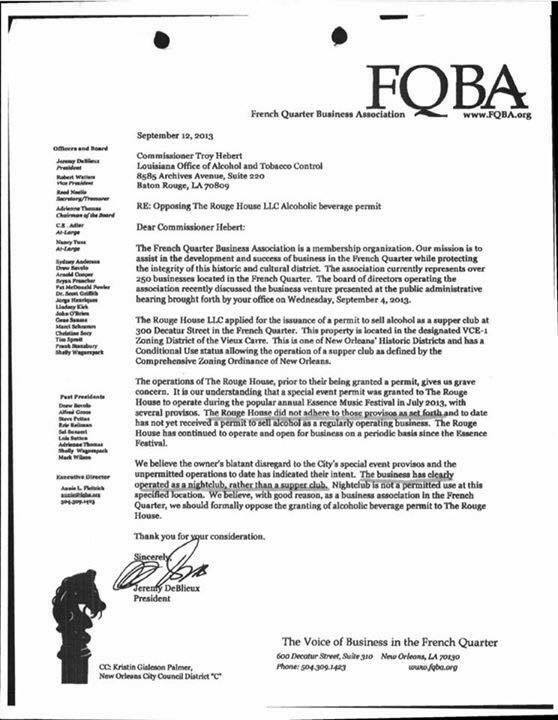 On September 16, 2013, the FQBA sent a letter to then ATC Commissioner Troy Hebert stating that the fact the business served alcohol during the limited license period proved Riley’s intent to operate a nightclub, and that the entirety of the FQBA opposed her being issued a liquor license. Three hours later, the ATC formally denied Riley’s application for a state liquor permit. But Riley didn’t give up. She applied again, and on December 5, 2013, was denied again. Meanwhile, in spite of an apparently incredibly strained budget, the Rouge House was subjected to over 21 surprise inspections in the course of eight months. In each instance, the business was within compliance. The constant opposition to her obtaining a state liquor license left Riley unable to make money from her business. As a result, she became financially unable to make the $25,000 payments to the building’s owners. On September 24, 2013, Biederman sent Riley a letter requesting that she peacefully surrender the property. The $50,000 deposit she had paid would not be returned. Riley objected, stating that her financial hardships and difficulty obtaining the state liquor license were 1) a result of the misleading terms of the lease, and 2) a result of the previous owner’s violations of city rules and ordinances. Riley has continued fighting for the Rouge House over the last several years. Most recently, she has filed a lawsuit against those who incorrectly and consistently opposed her business, an opposition she believes to be based on the fact that she is an African American woman – a claim that has been repeatedly denied. That case was assigned to Judge Lance Africk. In 2011, Judge Africk served as the President of the Sugar Bowl, an event whose goal is to bolster tourism to New Orleans. Believing that Judge Africk may have personal or financial ties to some of the defendants named in her case as a result, Riley asked him to recuse himself from the case. Judge Africk refused. 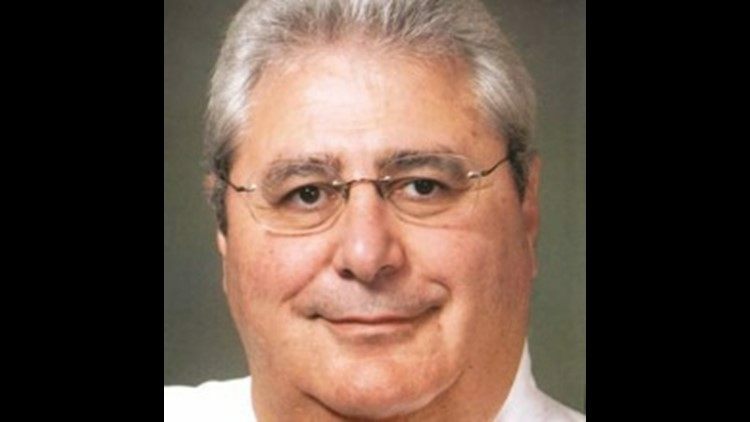 According to Riley, Judge Africk has been consistently combative throughout the case, complaining about the number of defendants and aggressively questioning Riley about her legal In Forma Pauperis status. At one point, Riley was attending a pretrial hearing regarding the status of summonses that were to have been served by the U.S. Marshall’s service. However, instead of covering that material, Judge Africk aggressively questioned Riley about her financial status, accusing her of lying about her assets. He later revoked her In Forma Pauperis status. Though that status was later reinstated, Judge Africk dismissed all the defendants in the case, leaving no one to be served. As a result, the case was dismissed. An anonymous witness in the courtroom during that hearing later uploaded a video of the Judge’s attitude and behavior from the bench to social media. Seeing it, Riley shared it on her own social media accounts as further proof of the opposition she is facing while trying to open her business. Two days later, U.S. Marshalls showed up at Riley’s door with a summons from Judge Africk demanding that she remove the video. Furthermore, the judge also ordered that, although she is not the one who took or posted the video originally, Riley now is forbidden from carrying her cell phone inside the U.S. Federal Courthouse in New Orleans, where she still has cases pending. Upon entering the building, she must announce her name, have her cell phone removed, and be escorted at all times by a U.S. Marshall. A Big Easy Magazine reporter was witness to this, and other aggressive and combative behaviors toward Riley when attempting to interview her at the courthouse in the process of creating this article. In spite of the interview taking place in an enclosed room away from any court proceedings, our reporter was forbidden from using a tape recorder to record the interview. The reporter stated that at several points the U.S. Marshall assigned to Riley seemed to “look down” on Riley, behaving in an intentionally combative manner. On April 5, 2019, Riley has a Writ of Possession hearing to reoccupy her building. Big Easy Magazine plans to update this article with the results of that hearing as soon as we receive them. Thank you for continuing to show that Big Easy Magazine has the courage to speak to truth! This story has touched my soul again,after following Major Riley on Facebook for a few months I admire her FIGHT. I can’t wait to hear VICTORY in this case. I’m so disgusted by our judicial system. They’re just bullying a black woman because they know they can get away with it. And WHAT IN THE HECK is up with her having to be escorted by a US Marshall?!? They’re straight up treating her like a terrorist. Absolutely infuriating. Thank you for covering this, and I look forward to updates on this story. Especially if they include justice. I would never, ever, do business in Orleans or Louisiana for that matter. They will allow something and turn around and reverse it. It’s still old money and who you know.